Releasing a game that's similar to Minecraft on a new platform has its benefits. FortressCraft developer Projector Games has had it rough since the Xbox Live Indie game started becoming known on the internet. 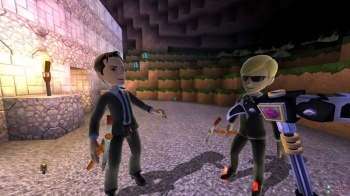 The big problem is that it looks and plays similarly to Minecraft, a massively popular indie title for the PC, causing many to call the game a rip-off or a clone. These complaints haven't hurt FortressCraft's sales though, with Projector announcing that the game is the fastest selling Xbox Live Indie title of all time. Projector is releasing FortressCraft in chapters. The first chapter was made available for 240 Microsoft Points ($3) on April 8, and features building with multiplayer. On the first day, Projector says that FortressCraft: Chapter 1 sold 16,000 copies. The game also had a 70% conversion rate, meaning that 70% of the people that tried the game's demo went on to buy it. This is massive for an Xbox Live Indie title, whose conversion rates tend to be much lower. Projector points out that FortressCraft sold more copies per day in its launch weekend than Minecraft currently does. That might be because Minecraft has already sold nearly 2 million copies. Projector plans to continually update each FortressCraft chapter, while subsequent chapters will add larger features. Believe it or not, the game is said to be inspired by Dwarf Fortress, not Minecraft, and Projector attempts to prove it with this video. However, it's hard to say that FortressCraft didn't at least benefit from Minecraft's popularity.